Viral bronchiolitis is the most common cause of hospitalization in infants under 6 months of age, and 70% of all cases of bronchiolitis are caused by respiratory syncytial virus (RSV). Early RSV infection is associated with respiratory problems such as asthma and wheezing later in life. RSV infection is usually spread by contaminated secretions and infects the upper then lower respiratory tracts. Infected cells release proinflammatory cytokines and chemokines, including IL-1, tumor necrosis factor-α, IL-6, and IL-8. These activate other cells and recruit inflammatory cells, including macrophages, neutrophils, eosinophils, and T lymphocytes, into the airway wall and surrounding tissues. The pattern of cytokine production by T lymphocytes can be biased toward 'T-helper-1' or 'T-helper-2' cytokines, depending on the local immunologic environment, infection history, and host genetics. T-helper-1 responses are generally efficient in antiviral defense, but young infants have an inherent bias toward T-helper-2 responses. The ideal intervention for RSV infection would be preventive, but the options are currently limited. Vaccines based on protein subunits, live attenuated strains of RSV, DNA vaccines, and synthetic peptides are being developed; passive antibody therapy is at present impractical in otherwise healthy children. Effective vaccines for use in neonates continue to be elusive but simply delaying infection beyond the first 6 months of life might reduce the delayed morbidity associated with infantile disease. The World Health Organization estimates that approximately 14 million people die each year from infections that are transmitted via the respiratory tract, most of which occur in childhood. Viral infections of the respiratory tract are particularly serious during infancy, and viral bronchiolitis is the most common cause of infantile hospitalization in the developed world . It has been estimated to cause 91,000 admissions per year in the USA, with associated hospitalization costs of $300,000,000 per year. Respiratory syncytial virus (RSV) accounts for approximately 70% of all cases of viral bronchiolitis . RSV bronchiolitis usually affects children under 1 year old, with a peak incidence at age 2–4 months . During this period of development, the lungs are growing rapidly and undergoing alveolar septation. Bronchiolitis may cause severe insult to the lungs during this critical period, and might cause long-term effects by delaying or preventing normal postnatal pulmonary changes. This could result in smaller lungs in later life that are more susceptible to disease. Alternatively, neonatal infection may cause long-lasting changes in host immunity . A recent study  showed that infants who experience RSV bronchiolitis are more likely to develop wheezing and asthma later in life (Fig. 1). This paper reviews the basic mechanisms of RSV infection, with particular reference to links between early RSV infection and the development of later respiratory symptoms and disease. Association between bronchiolitis during infancy and wheezing or asthma in childhood. Infants who experience RSV bronchiolitis are more likely to develop wheezing and asthma at 1, 3, and 7 years of age than are matched controls who did not experience bronchiolitis as infants . RSV belongs to the paramyxovirus family. It is transmitted by respiratory secretions and by direct contact with contaminated surfaces or materials. The most common way in which RSV is spread is by direct hand-to-hand contact. Infection occurs when the virus replicates in the tissue. Epithelial cells are the main target cells for respiratory viruses, but alveolar macrophages can also be infected. Infection begins by binding to specific receptors on the surface of the host cell, followed by internalization and uncoating. The viral RNA core is then released into the cytoplasm of the host cell, where it replicates and is translated by the host cell machinery into viral particles. Viral assembly occurs in the cytoplasm and at the cell surface, after which virions are released from the cell. Released virions then infect other respiratory epithelial cells. RSV was originally thought to be restricted to the respiratory tract, but recent studies have demonstrated viral RNA in peripheral blood cells during acute infection. It has been suggested that peripheral virus is not viable but data suggest it may be able to replicate . In cattle, RSV appears able to persist in local B lymphocytes . Infected epithelial cells and alveolar macrophages activate the immune system's defenses. The cells release chemokines, proinflammatory cytokines, and mediators that include IL-1, tumor necrosis factor (TNF)-α, IL-6, IL-8, macrophage inflammatory protein (MIP)-1α and RANTES (regulated on activation, normal T cell expressed and secreted). Elevated levels of IL-6, IL-8, TNF-α , and IL-11  have been found in nasal lavage fluid of children with acute upper respiratory infections. These cytokines and chemokines contribute to airway inflammation and bronchial hyperresponsiveness, as well as to mucus hypersecretion and sneezing. Production of multiple cytokines and chemokines induces ingress into the airway of diverse inflammatory cells and their activation. IL-8 secretion causes influx of neutrophils, which are present in nasal secretions of children with rhinovirus upper respiratory infections  and in bronchial secretions of children with RSV infection . RANTES and MIP-1α are potent chemokines for eosinophils. Increased levels of RANTES and MIP-1α have been found in the nasal aspirates of children with virus-induced asthma exacerbations  and in lower airway secretions of infants with RSV bronchiolitis who are given ventilatory support . The viral inflammatory response includes activation of cytotoxic T cells. Virus-specific cellular cytotoxic activity has been demonstrated in infants with acute RSV infection . Once in the airway, recruited cells prolong inflammation by releasing further cytokines and chemokines that attract and upregulate other inflammatory cells. T-helper (Th) cells are found in the airways of individuals with RSV infection . T cells produce proinflammatory mediators that include type 1 cytokines or type 2 cytokines. Th1 cells secrete IL-2, IFN-γ, and lymphotoxin, whereas Th2 cells secrete IL-4, -5, -6, and -10. IL-4 and IL-5 promote IgE production and eosinophilia . These types of T-helper lymphocytes are selectively promoted, depending on the cytokine environment that is present during priming (largely determined by innate immune responses, site, concentration of antigen, and infection history). The balance between Th1 and Th2 responses is important in coordinating the protective and immunopathogenic responses to viral infection [17, 18]. The immune system undergoes rapid development prenatally and during the first months of postnatal life. Infants show a greater propensity to develop Th2 responses than do older children. In the newborn, passively acquired maternal immunoglobulin appears to protect against infection. This may be the reason why children under 8 weeks of age are rarely infected with RSV. Maternal antibody concentration decreases during the first 6 months of life, leaving infants between the ages of 2 and 4 months unprotected against infection. RSV bronchiolitis is most common in children younger than 6 months old. More than two decades ago, studies showed that infants with the highest titers of transplacentally acquired RSV-specific IgG developed less severe RSV pneumonia and had fewer infections than did infants with lower titers . Other studies suggest that passively acquired maternal antibody suppresses the development of the infant's own immune response [20, 21]. Local mucosal B cells can produce IgA, the predominant immunoglobulin in respiratory secretions. IgE interacts with mast cells causing mediator release, which may contribute to airway narrowing, obstruction, and wheezing. Welliver et al. observed increased RSV-specific IgE in nasal secretions of wheezing children with acute RSV infection, but other groups have not been able to confirm that finding. The mouse model of RSV disease is well characterized and has given rise to a wealth of immunologic information regarding antiviral defense and immunopathogenic mechanisms . Virus replication peaks on day 4 or 5 after mice are exposed to the pathogen, and cultivable virus is cleared between days 7 and 9. However, PCR for viral RNA is still positive for up to 100 days or more after infection. In terms of the cellular immune response, infected mice show few changes for the first 3 days, but on day 4 lymphocytes start to be recruited to the airway epithelium. Natural killer cells are initially abundant in bronchoalveolar lavage fluid and produce IFN-γ. Over the next few days these cells are replaced by Th1 CD4+ and CD8+ cells, which also produce predominantly IFN-γ during primary infection of unvaccinated animals. The cytokines produced determine the predominant type of pathology observed . Openshaw et al. reported that early IFN-γ production is a key controlling element of Th1/2 balance during subsequent infection (Fig. 2). Without IFN-γ a Th2 cytokine profile persists, which leads to lung eosinophilia. Priming with the major RSV surface glycoprotein G expressed in a vaccinia virus vector (recombinant vaccinia virus [rVV]-G) fails to stimulate IFN-γ production by infiltrating cells during pulmonary challenge, leading to Th2 cytokine production and to lung eosinophilia. In mice primed with rVV expressing the fusion protein F, Th1 cells produce IFN-γ, inhibiting lung eosinophilia. Production of lung eosinophilia in the mouse model of respiratory syncytial virus (RSV). 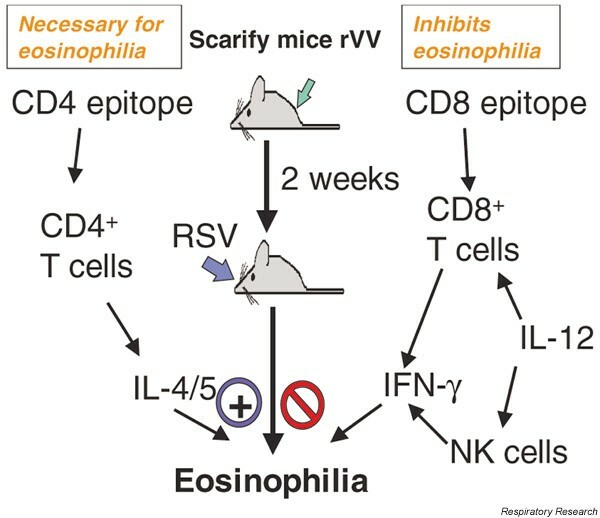 Lung eosinophilia is linked to the inability of the major surface glycoprotein G of RSV (RSV G-protein) to stimulate T-helper (Th)1, or CD8+, cells to produce IFN-γ. Once activated, Th1 cells stimulate macrophages and dendritic cells to produce IL-12. This induces natural killer (NK) cells and Th1 cells to produce IFN-γ. In the presence of IFN-γ lung eosinophilia is inhibited; in its absence the Th2 response persists. Th2 cells produce IL-4 and IL-5, which causes lung eosinophilia. Adapted with permission from Openshaw et al. . rVV, recombinant vaccinia virus. As stated above, in the absence of IFN-γ the Th2 response persists. Th2 cells produce IL-4 and IL-5; the latter is associated with delayed hypersensitivity and causes lung eosinophilia . When this response occurs in infants, it permits the establishment of the Th2 response as part of T cell memory, which is long lasting. The immunologic response may also be determined by genetic factors. In different strains of mice, RSV infected animals exhibited different Th1 or Th2 responses . Hence, the pathogenesis of bronchiolitis inevitably varies between species and between individuals with different genetic and environmental backgrounds. A recent study found that T-cell activation (as measured by plasma levels of soluble serum IL-2 receptor, sCD25) was elevated for 5 months after infantile bronchiolitis, regardless of severity ; this is in marked contrast to the rapid normalization of soluble IL-2 receptor levels in other acute viral infections. Such studies suggest that effects from RSV infections may be responsible for respiratory problems later in life. Increased respiratory symptoms have been noted in children who have recovered from RSV bronchiolitis, and this association lasts for 8–13 years [29, 30]. Sigurs et al. followed 47 children treated for RSV bronchiolitis as infants for 3 years and subsequently for 7–8 years . Compared with controls, the RSV-infected patients had a higher rate of asthma diagnosis (23% versus 1%) and reductions in measurements of airflow; no differences in lung size were observed. Noble et al. reported similar findings in 61 patients followed for 9.5 years after hospital admission for bronchiolitis. 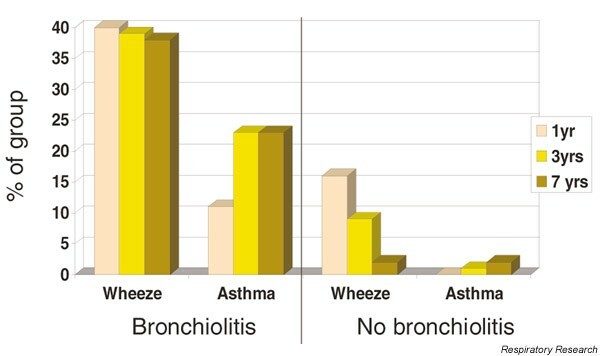 Compared with controls, children who had been treated for bronchiolitis had a higher frequency of cough and wheeze, and increased bronchodilator use. In another study, persistent wheeze at the age of 7–8 years was directly related to the level of RSV-specific IgE measured in the nasopharyngeal secretions during the initial illness, which occurred during the first 6 months of life . No change in lung function was reported at 7–8 years of age. Similarly, peripheral blood eosinophilia at the time of acute bronchiolitis was found to predict wheezing at 7 years of age . From data obtained in mouse experiments, it was hypothesized that initial RSV infection increased Th2 sensitization to subsequent respiratory infections and to inhaled antigen. To test this hypothesis, IL-4 and IFN-γ production, and proliferative responses to RSV antigens and nonviral allergens was measured in peripheral blood cells of 7- and 8-year-old children . RSV-specific enhancement of IL-4 production was found in children with a history of bronchiolitis, whereas all exposed children (regardless of the severity of first infection) showed good IFN-γ responses . This finding is in agreement with studies by Teran et al. , who reported asthmatic exacerbations following viral infection altered cytokine responses. Animal studies generally support the idea that there is a direct causal link between RSV infection and delayed wheezing disease. In guinea pigs, RSV infection causes increased sensitivity to inhaled histamine for at least 6 weeks . Brown Norway rats develop chronic, episodic, and reversible airway obstruction after bronchiolitis . This condition is produced by a Th2 response with reduced IFN-γ production. In cattle, viral persistence in B cells has been demonstrated . If the initial RSV infection causes permanent damage to the epithelium, cilia, or lung structure, then it may be easier for antigens to penetrate the lung . In addition, clearance of material from the lung may be impaired. These factors may leave the lung vulnerable to later colonization with a nonviral pathogen that could have delayed effects or cause secondary infection. Other possible mechanisms for the delayed effect are virus chronicity, persistence or latency [4, 39], and immunologic tolerance . Two hypotheses have been suggested [40, 41] to explain this phenomenon (Fig. 3). 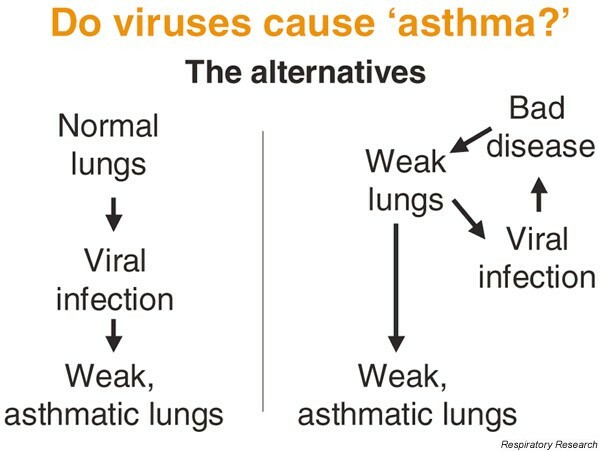 The first is that early viral infections directly damage the developing lung or alter host immunity, and result in recurrent respiratory symptoms and subsequent airway dysfunction. The second hypothesis is that initial respiratory infection unmasks an inherent susceptibility to long-term respiratory problems. Both of these factors may contribute to delayed respiratory problems in some individuals, and are not mutually exclusive. Delayed effects of acute respiratory syncytial virus (RSV) infection: possible mechanisms. The link between RSV infection and delayed respiratory problems may be explained by a severe initial infection, which either alters the host lungs or immunity, leading to future wheeze, or reveals an underlying tendency to wheeze. Adapted with permission from Balfour-Lynn and Openshaw . If early RSV infection causes delayed respiratory problems, then prevention or delay of neonatal infection is highly desirable (Table 1). Delaying RSV infection would allow the lungs to mature and the immune system to develop and protect infants against sequelae caused by viral chronicity or persistence, a 'hitchhiking' pathogen, lung remodeling, immunologic memory, and bystander sensitization. Preventing RSV infections would not alter delayed effects of previously small lungs or genetic predisposition. RSV, respiratory syncytial virus; Th, T-helper. The long-term results of studies of passive or active immunization against RSV disease are therefore keenly awaited. New studies are underway that aim to determine how immune-specific responses can be directed to Th1 or Th2, in the hope that stimulating Th1 responses during the first exposure will be beneficial and reduce the long-term sequelae of natural RSV infection. Progress is being made with vaccines based on viral subunits, live attenuated strains of RSV, DNA vaccines, and synthetic peptides [42–44]. In ongoing clinical trials, vaccination of breast-feeding women appears to protect neonates from RSV infection during the critical first few months of life . The results indicate the presence of RSV-specific antibody in breast milk is not associated with adverse effects on neonatal or infant immune responses to RSV, but more studies are underway.